Q: Since when are there tigers in Mexico? Q: What is a gila monster? "It's a great joke played on us by the lord, fate, nature or whatever"
Film noir takes a Mexican holiday in this gritty adventure from John Huston. Pessimistic and full of irony, yet with a sense of adventure and a moralist edge to it, this is typical Huston material. Huston insisted on shooting on location in Mexico, which riled up studio executives no end, but it paid off in the quality of the picture. 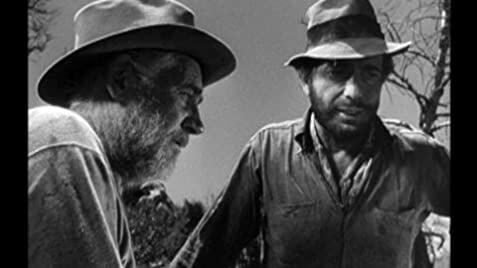 Treasure of the Sierra Madre would have really suffered in the canned air of a studio. By using the real thing, he perfectly achieves the stark and dusty atmosphere of the poverty riddled Mexican city in the earliest scenes. The sense of scale and grandeur of the mountains in the main part of the film is also very important in achieving the right effect. Huston's background was in fine art, and it's at this point in his career as a director that it really starts to show. The use of lighting is painterly in a way that is almost impossible to achieve in black and white  particularly in the scene in the peasant village which looks almost biblical. Huston also has this unique style of framing, whereby he uses figures in the foreground and background to give the effect of a close-up and a mid-shot simultaneously. It's a look that is totally at odds with anything else produced in Hollywood at that time. 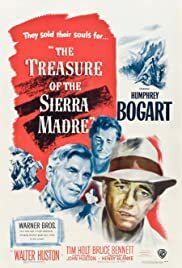 Actor wise, Treasure of the Sierra Madre turns the clock back to the 1930s, putting the director's father Walter Huston in a starring role, and casting Humphrey Bogart as a seedy villain. The cast is rounded off by the too-little-seen Tim Holt. All three of them are spot on. The spry old prospector is a role Huston senior seems to have been waiting to play all his life. Bogart is also great playing the sort of character he made his name with a decade earlier. Also worth a mention is Mexican actor Alfonso Bedoya who gives what is for this era an incredibly naturalistic performance as the bandit leader. Huston's forte was in his cinematography, his shot composition and the rhythm of his films, not so much in his handling of action or actors, which is why his pictures tend to be a bit hit and miss. This one is a hit though, thanks to the strength of its story and the quality of the cast, not to mention Huston's persistence for authenticity. Not my absolute favourite of his work, but certainly one of the best.